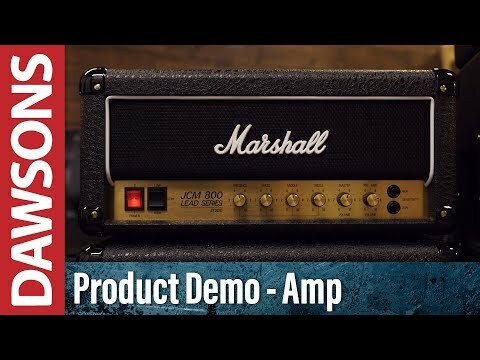 The Marshall Studio Classic SC20C Combo Guitar Amplifier has been specially designed to replicate one of the all-time classic amplifiers, the JCM800 2023. The Studio Classic SC20C squeezes all that powerful JCM800 sound into a much more manageable 20 Watt Combo, making for an amp that works great in the studio and at home, maintaining that quality tone at a volume that won't get noise complaints. With 2 x ECC83 (plus 1 x ECC83 phase splitter) in the preamp stage and 2 x EL34 in the power amp, the Marshall Studio Classic SC20C perfectly replicates that classic Marshall crunch in a portable and compact package. For times when a quieter tone is required, there is a handy power reduction feature that allows you to drop the full 20 Watt output down to a much more manageable 5 Watt, perfect for capturing that huge tone in the recording studio or practising at home. The original JCM800 was revered for its simplicity, being a very much plug and play style of amplifier and the Studio Classic SC20C is no exception. With a simple, tried and tested combo of Treble, Middle, Bass and Presence on the EQ, you can quickly sculpt the tone you want without any unnecessary extras. The Pre-Amp and Master setting allow you to adjust your volume as you please, whether that's cranking for a gig or fine-tuning for the studio. The Marshall Studio Classic SC20C features a single 10-inch Celestion V-Type Speaker which delivers well-balanced tone, mixing vintage aesthetic with modern speaker design to give you sparkle in the upper mids and plenty of grunt in the lower ranges. This speaker gives the SC20C versatility, enabling you to get the tone you want no matter what style you're going for and equal adaptability whether you're playing rhythm or lead. With High and Low inputs you have options for connecting various types of guitar, with the High giving you more gain and the Low more suited to clean tones. The SC20C also features an FX Loop, Direct Out for connecting to Mixing Desks and Front of House, as well as outputs for hooking up a cab for extra grunt. With this plethora of connection options, you're armed for any situation, studio or stage.